In the inaugural interview on "Piers Morgan Tonight," talk show queen Oprah Winfrey recalled contemplating suicide at 14 because she was pregnant, and how she feels she was given a second chance when she lost the baby. "I thought, 'Before the baby was born, I’m going to have to kill myself,' " she told Piers Morgan during the interview, which aired on CNN Monday night, citing the stigma of being an unwed mother at the time, and her father's view of unwed mothers. Her mother in Milwaukee sent her to live with her father in Nashville, and he didn't know she was pregnant. "My father ... said to me as I'm standing in the kitchen listening to him, 'These are the rules of the house, you're going to obey the rules, you have a 10 o'clock curfew, and I would rather see a daughter of mine floating down the Cumberland River … than to bring shame on this family and the indecency of an illegitimate child.' "
She said she didn't come close to killing herself - "I did stupid things like drinking detergent and all that kind of crazy stuff that you do when you’re trying to get attention when you’re really just trying to cry for help," she said. "But this is my 14-year-old self. I don't even know what I thought the plan was going to be. ... You're having a baby out of wedlock, your life is over. So when the baby died – the baby was never brought home from the hospital – when the baby died, I knew that it was my second chance. "So I went back to school, and nobody knew. Because had anybody known at that time, I wouldn’t have been able to be head of student council. I wouldn’t have been able to be speaking champion in forensics. … I wouldn’t have been chosen as one of the two teenagers in the state of Tennessee to go to the White House conference on youth. None of those things would have happened, and the entire trajectory of my life would have been different." She discussed the baby and the suicidal thoughts after being asked whether any part of her wondered what would have happened if the child had lived. Winfrey also discussed how her heart was broken twice, why she is not one for marriage, what she intends for her fortune when she's gone, and how she wishes everyone would have a Gayle King in their life. Morgan's show takes over CNN's 9 p.m. ET time slot from longtime CNN host Larry King. The show's first week continues with Howard Stern on Tuesday and former U.S. Secretary of State Condoleezza Rice on Wednesday. Second try: The coldness and nonchalance about stillborn baby at age 14, shown by Oprah who I hold in usual high esteem troubles me insofar as she regarded the baby's demise as her "Second Chance". What about the baby's rights and chances after the drink of detergent? It's all about me! Sad. She's almost as narcissistic as the other O from Chicago. 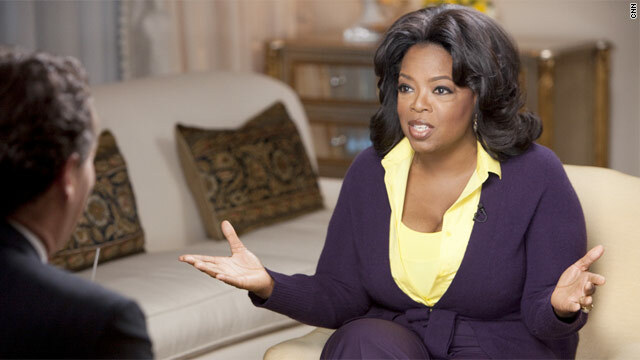 Man, do I hate Oprah–and what she did to Discovery Health!! Yup. Motherhood sets us back. Let those without sin cast the first stone! I cannot help but wonder how the baby died. Was he a preemie? She also never refers to him as "son". A little strange and heartbreaking. My kids and grandkids are so special, a gift from God! I can't image anyone being glad she lost her baby. She does not know what she missed out on!!! Burn in hell, Oprah. Your soul belongs to the Devil. Attractive element of content. I just stumbled upon your blog and in accession capital to claim that I get in fact enjoyed account your blog posts. Any way I'll be subscribing to your feeds and even I achievement you get right of entry to consistently quickly.